In the midst of all of the bad economic news, something has to give. When things are tough is the time when we have to make time for fun. I learned this in a major way from my best friend. She died from breast cancer on Christmas day 2005. No matter how bad things were, she made sure that she had opportunities to have fun. I remember talking to her on the phone on time. She told me that I was too stressed and that I needed to have more fun. She told me this often. The last time she told me about having fun was a week before she died. She was actually planning a party – from her bed. She had called a caterer and sent out invitations and was really looking forward to it. We were planning to go to this party (she lived in Nashville and we lived in Arkansas). She told me we should have a great time but she hoped we wouldn’t be disappointed. I know she knew she wouldn’t be there. I think about her every day and know how much better she made my life. When times are tough, I can smile and remember to have fun in her honor. She would love that. Do at least one fun thing today. Combine 1/2 cup dishwashing detergent, 4 1/2 cups water, and 4 tablespoons of glycerin in a large container with a cover. Mix well, then allow the mixture to rest, covered, until ready for use. Pour bubble solution into a shallow container. 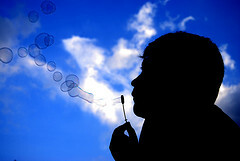 Dip bubble wands — such as cookie cutters, shaped pipe cleaners or wire — into the solution and blow! Joy is usually the recommended brand of dishwashing liquid. For best results, use distilled water. As an alternative to glycerin, some recipes recommend using white corn syrup.